How much of our temperament is based on genetics, and how much is experiential? For Edvard Munch it may have been more of his life circumstances that shaped his morose outlook on life, than the fiber of who he was at birth. Born in 1863 in Norway, Edvard was the second child of five. His early life was tainted with the death of his mother at age 5 and his beloved older sister when he was 14. As if this weren't tragedy enough, a younger sister was diagnosed with mental illness and institutionalized most of her life. His father, a physician, dealt with the loss of his wife by instilling religious fear into the hearts of the remaining children. Edvard considered himself ill as well, and wrote, "Without anxiety and illness, I am a ship without a rudder....My sufferings are part of my self and my art. They are indistinguishable from me, and their destruction would destroy my art." 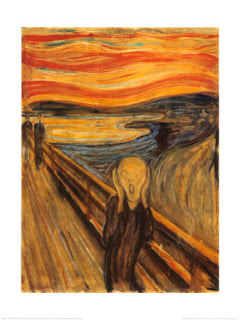 Although Munch is best known for his painting "The Scream"(1893), his other works are worthy of examination. Because of his early experiences with death, many of his pieces explore his emotional responses to the memories of his childhood. The first piece to exam in entitled "The Dead Mother and Child"(1897-1899) or the later version known as just "The Dead Mother"(1899-1900). What's interesting about these pieces are the differences. 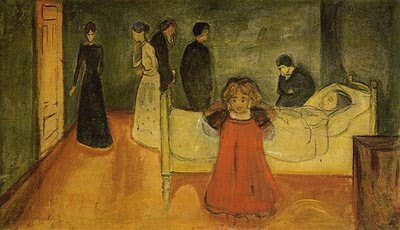 In the earlier painting we see the entire room, perhaps from Munch's perspective as he came to his mother's deathbed. Relatives are mourning in the background quite separate from the child. 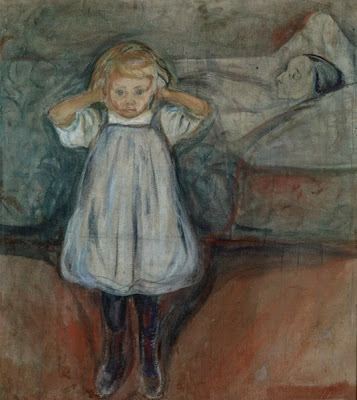 Munch's sister in red, eyes wide in horror, has her hands covering her ears, in an effort to block out something; maybe the reality of the situation, maybe the sounds in the room? His sister's mouth is open mid sob, or mid scream. In fact this posture is not unlike his most famous painting, "The scream"(1893). Contrast this version with "The Dead Mother"(1899-1900) done a year or so later. The viewer is now up close, and the child, still ears clasped with her hands, looks less horrified and more defiant. She's less emotional, implied also by her pale blue dress as opposed to the red dress of the other painting. Red is often used to symbolize passion. Using a cooler color fits well with this more composed painting. Could this be Munch working through the memory? Often painful things at first are recalled with intense emotion, and as we replay and retell things, while still significant, the initial emotional response can lessen. What does the piece say about child grief? Experts use words for young children experiencing death such as confusion, disorientation, and fear. Those words fit well for these pieces don't they? Edvard Munch said "The angels of fear, sorrow and death stood by my side since the day I was born". Because he was shrouded in early life with the losses of important people in his life, many of his works focus on sickness, death or mental anguish. In upcoming posts we'll take a look at these other dark themes, and how Munch's choice of paintings reflect his inner struggle.